A filtration force generated by the capillary action of an absorbent filter paper is applied to a sludge sample (pretreated or not). The apparatus consists of two main components: a filtration unit and an automatic time counter. The filtration unit includes a thick paper filter (usually Whatman n°17 or equivalent), sandwiched between two rectangular blocks of clear plastic. A hollow cylinder is placed on top of the paper filter at the center of the upper plastic block and used as a sludge reservoir. 1A and 1B are sensors placed on the first concentric circle around the sludge reservoir. Sensor 2 is placed on a second concentric circle. These three sensors are electrically connected to a counter. Fill the reservoir (diameter of 10 or 18 mm depending on sludge filtrability) with a representative sample of the sludge. If this is a control test with a small amount of sludge to work with, repeat the test procedure at least twice. If this is a flocculation study, respect repetitive conditioning methods. As soon as the cylinder has been filled with sludge, the filtrate gradually spreads on the filter paper and out of the cylinder under the action of the capillary suction. 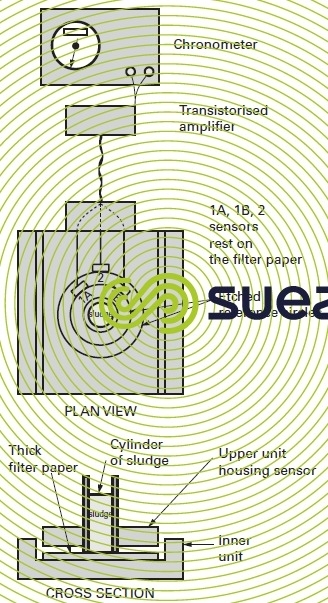 The rate at which the ring of filtrate spreads concentrically in relation to the area covered by the sludge depends on the quality of the paper filter but most importantly based on the sludge filtration capability. When the ring of filtrate reaches 1A and 1B, the increased conductivity between these two sensors initiates the counter. When the ring of filtrate reaches sensor 2, a similar change in conductivity between sensors 2 and 1A stops the counter. Therefore, the apparatus automatically determines the capillary suction time (CST), which is the time taken by the filtrate ring to extend from a 32 mm to a 45 mm diameter. The typical time to achieve this ring propagation is 5 to 10 seconds depending on the type of test apparatus used. The lower the CST the better the sludge filtration properties. This rapid test is used to compare the effectiveness of a mineral or thermal pre-treatment for a sludge (formation of fine floc). Under conditions of standard utilisation and for a given sludge (stable concentration) the CST can be correlated to the specific filtration resistance. Therefore, the CST provides a quick indication of a sludge filtration capability, which is usually sufficient for operational controls of filter presses or vacuum filters. When the CST is used to check flocculation with a polyelectrolyte, the results obtained cannot be applied when very distinct flocs of a few millimetres in diameter are formed. This is typically the case of flocculation required when using belt filters, in this case a simple drainage test is preferable. Fill the reservoir (diameter of 10 or 18 mm depending on sludge filtrability) with a representative sample of the sludge. If this is a control test with a small amount of sludge to work with, repeat the test procedure at least twice. If this is a flocculation study, respect repetitive conditioning methods.